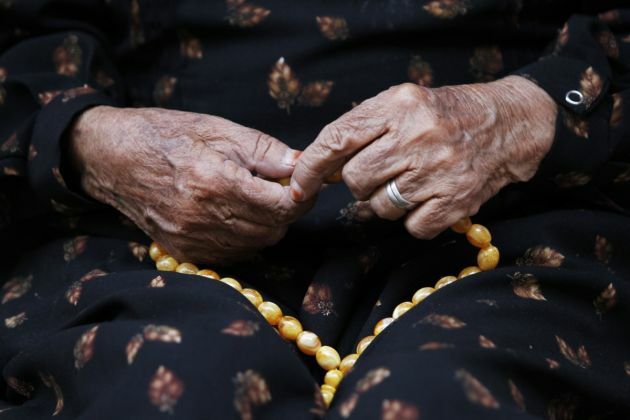 (Photo: REUTERS/ Mohamed al-Sayaghi)A woman holds a rosary in front of her house on the outskirts of Sanaa, Yemen on July 25, 2013. A woman from Yemen who was planning to leave the country with her husband due to persecution as both were converts has been burned to death because of her Christian faith. Nazeera, 33, was pouring oil into a hot pan when the oil bottle exploded, severely burning her. Her four children watched helplessly while her husband Saeed rushed to help her. "All I could think about was putting the fire out and then getting her to the hospital. "But my 16-year-old son, he couldn′t stop himself and held on to her, hugging her while she was burning. He got hurt, and I had to pull him away from her," Morning Star News quoted him as saying on August 29. Two weeks later, Nazeera died, on June 23. Saeed and Naezeera had been planning to leave Yemen because of intense persecution from relatives and friends. They got their travel papers two days before the tragic incident. It was later found out that members of both Saeed and Nazeera's family had taken the vegetable oil out of the bottle and replaced it with gasoline. Saeed went to police to report the conspiracy but police told him to bring in witnesses. "No one will be a witness for us," Saeed said. "And my family told me that if I was killed and cut into pieces, they wouldn′t do anything to help or be a witness on my side." In 2003, Saeed become a Christian together with his wife and children. Since then, he suffered unstinting persecution from his family and workmates. After being suspended from work for one year, Saeed was demoted to teaching primary school instead of his usual secondary school appointment. He was also transferred to a school three miles (five kilometers) away from his home where he had to walk each day. And he says because he refused to participate in efforts to support Muslim terrorists, he was labeled an "infidel" and was assaulted in front of more than 1,000 students. After all that has happened, Saeed said God allowed the persecution to take place to strengthen their faith and use this as a mighty testimony. In the end, he asked for prayers as he and his family start a new life away from Yemen. "We need prayers for God's strength and to give us strong faith. I want people outside to know that even if we get cut into pieces, we won′t leave Jesus Christ." Islam is the State religion of Yemen, and sharia law is the source of all the country′s legislation. Conversion from Islam is considered apostasy, and is a crime that can be punishable by death.